While our family has never gotten to meet Goofy, and we hope to change that this upcoming trip, our whole family loves him. My oldest son adores the classic Goofy cartoons, especially the one where he is trying to get his new TV system set up, and I absolutly loved The Goofy Movie as a kid. I loved being able to share that with my oldest recently!! Do any of you remember that movie? The music was the best!! I've got the link at the bottom of the page if you want to relive your memories! Happy Birthday Goofy!! We love you! 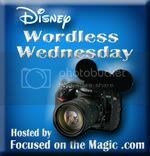 Proud to be posting with the Disney Wordless Wednesday Blog hop hosted by Deb at Focused on the Magic.com. Our Magic Bands 2.0 arrived! It was interesting to see the difference between them, and the originals. We are curious about the new Magic Keepers, and trying out different ways to wear the Magic Band, other than on our wrist. These luggage tags are absolutely adorable! The best part is that each coordinates with the magic bands above! Of course, being the completionist my oldest son and I are, we both were sighing over the fact we couldn't have the blue (Donald) and the pink (Daisy) as well. That would have been awesome! Even the backs are adorable!! They came with clear straps for the tags, and while in the past I have used similar, I have lost a tag or two before. While we aren't going to use these, we'd rather keep them to look at, if we were going to use them, I think we would attach a little differently, so that they are more secure and don't get lost! Do you like these better than the original Magic Band? I feel like the oval design of the face is going to make it easier to use, you might not have to do arm yoga to line it up just so... and the fact you can pop out the center puck and wear it in multiple ways just seems really fun, and a great way to personalize it! ​Target has recently gotten some fun Disney stuff in their Dollar Spot. Whether you need surprises to pull out on a road trip or activities to keep the littles busy during summer break, they've got you covered! Check out a few of the fun things I found! Cute bags with notepads, a pen, a pencil, a jumbo eraser and stickers. Both of these came home with me! There were others as well. $3 each. Star Wars tsum tsums! How cute are they?! Only $1! An absolute steal. I think these stamp sets are worth way more than $1! ​Sidewalk chalk and a chalk holder for $1, there were so many kinds to choose from. There were many more other than Star Wars to choose from, this is just what ended up in my basket! $1, and there is a bag of puffy stickers too! Adorable tsum tsum jumbo erasers in all different kinds, only $1! Isn't this so cool?! Star Wars tsum tsum jumbo erasers on a pencil! You almost feel bad buying it for just $1. Memo sheets! What better way to remember to stock up on Disney snacks than to leave a note for yourself? $1 for all this cuteness. Plush keychain and cute mini pens, only $1! Just because you have to work doesn't mean you can't have a little magic at your desk! I bought two of these! Just $1 for 50 awesome sheets. There was some other really neat stuff at Target's Dollar Spot, but these were my favorites, and caught my eye for best value, and uniqueness. Which is your favorite? Rapid Refill Mug: Worth it or a Waste? The mug, and it's unlimited refills costs $17.99 for the length of your stay. In our opinion, it's completely worth it for the mug since just three drinks in it a day and it's paid for by day two, but I know there are people who don't drink anything other than water, so you'll need to figure out what works best for you. There is always the option of just buying one or two mugs for a family, if some are soda/tea/coffee drinkers and some are not.